Announcing Axton John Maxwell, the newest arrival! This was posted on January 29, 2019 by Sarah Maxwell. We’re praising the Lord for the safe arrival of Axton John Maxwell, born to John and Chelsy late Saturday night, the 26th. He weighed 7 lbs. 5 oz. His birth wasn’t without drama, and after a long, hard labor at home with an awesome midwife and support team, they went into the hospital and delivered Axton. Despite the intense labor and delivery, when Chelsy shared the story, there wasn’t a word of complaint. She has such a sweet attitude about it. Chelsy was just so grateful that she did not need a C-Section. Chelsy and Baby Axton are doing great! You might wonder the background behind Axton’s name. Simply put, John and Chelsy fell in love with the name. They wanted something strong and simple but unique. They are very excited to begin the journey of raising Axton in the nurture and admonition of the Lord. We’re grateful for such a sweet gift of life! John and Chelsy’s hearts are already knit to Axton’s, and it’s adorable to see them love their little guy. 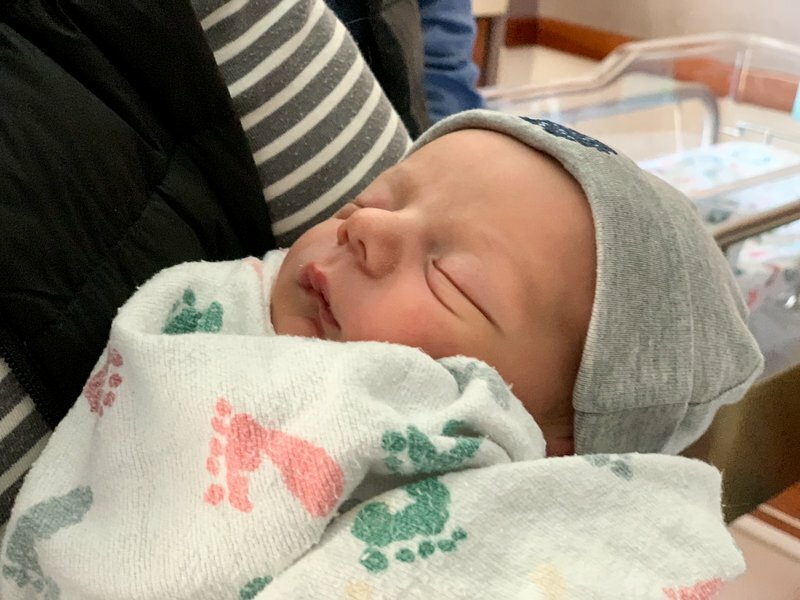 Please join us in welcoming Axton John Maxwell! 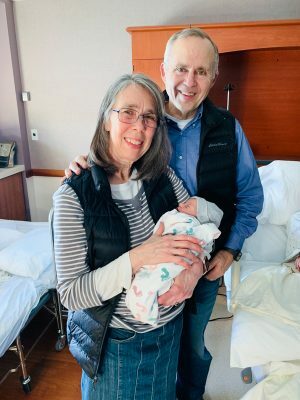 Dad and Mom with their newest little grandson, Axton Maxwell! Celebrating 2500 Titus2 Blog Posts! What a joy for all the family! I sympathise with Chelsy having gone through a long and difficult pre-labour last week, but we both have the joy of the tender and kind plan of God at the end of it!! We are SO happy for you and Teri and Steve, and all the Maxwell extended family. May your handsome Axton find grace and hope in the Lord Jesus Christ. What a sweet gift, enjoy him. Yay!!! Happy Birthday young sir! What a handsome boy! Welcome to the world Axton! Good job mama, and congratulations to everyone! Yes, good job, Mama! Chelsy was so positive about John’s support and the team she had at home and the one in the hospital through a really tough labor and delivery. He is a beautiful and wonderful little miracle from God!!! Agreed, beautiful and a miracle from God. Congratulations and blessings! Welcome Axton! Many congratulations to you and every blessing for this new life. Praise Him–I mean that very, very sincerely. But why is a c-section evil? 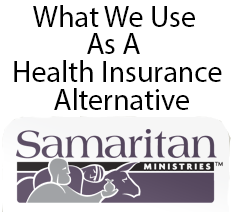 It’s life-saving. Praising again for safe birth for both mother and baby. Hmmm, Chelsy said she was happy she didn’t need a c-section, not that it was evil. I am guessing most moms would rather not have a c-section if it wasn’t necessary. For sure! I had 3 C-sections and would have loved to avoid them, although I recovered incredibly well. Surgeries add a huge risk. If that risk is necessary, of course you have one. But you certainly breathe a sigh of relief when baby is born without one! Anyway, congratulations on the newest Maxwell blessing. He’s so precious. When it is life or death, yes, C-sections are something to praise God for. My husband is a pediatric occupational therapist and has seen the many negative effects a C-section birth has upon a child. Many times a “section” child cannot tolerate hugs or similar physical affection as they were not squeezed when coming down the birth canal. A section baby also does not get inoculated with the mother’s flora/gut flora (which happens as the baby comes out of the birth canal), this results in very poor gut health for that baby and gut health is EXTREMELY hard to repair/restore. A child with poor gut health has a much higher risk of ending up on the autism spectrum or with auto immune issues. My hat is all to ALL mothers, however their precious children were born! Thank you for choosing life. Congratulations on the arrival of the newest little Maxwell. What a cute bundle of joy–God bless all who helped him arrive safely into the world! Rejoicing with you. May the Lord Bless you as you seek Him in each step of your parenting adventure. Thankful for His protection over Chelsy and Axton through delivery. So grateful for God’s hand of protection on Mommy and Baby! What a beautiful son- congratulations! Congratulation to Chelsy and John. Axton looks precious in the arm of some very delighted and blessed parents and grandparents! Yes! Congratulations, and just in time for Chelsy’s birthday! We are rejoicing with you all in the safe delivery of Axton. I like the uniqueness of his name. I thought that will all the blessings in your family, that you would run out of Biblical names. Not so, because I looked it up and the source said there were about 250 women’s names and 950 men’s names in the Bible. Even so, the popular ones make it a little confusing. In our small church there are 3 Abigails, 3 Hannahs, and 3 Elizabeths (ours goes by Bess). May God bless John and Chelsy as the seek to raise Axton John in the nurture and admonition of the Lord. Yes, they did find a unique name and one they both liked. Oh! Congratulations, such wonderful news. Praise the Lord for a safe arrival. Congratulations! He is so cute! I love the name. What happy news! He is adorable and I’m so happy that everything turned out well for them. Congratulations to all! He’s precious! Congratulations John, Chelsey, aunts, uncles, grandparents, and cousins! 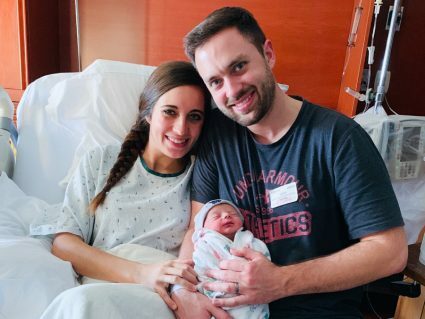 Praise God Chelsy delivered a healthy baby despite the drama! 🙂 some babies sure like to make their entrance into the world exciting! Thank you. Everyone is sure happy and excited! One of my friend’s nephews is named Axton. I think it is very strong but not too trendy. A nice name :). I’m glad she was able to avoid a C-section. Although they are sometimes necessary, it is a major surgery and also can limit future deliveries because of damage it does to the uterus. The baby looks adorable, and the new parents look very happy. Congrats! Congratulations to Chelsy and John! Baby Axton is a cutie! He’s so precious! Congratulations, Maxwells! I had a very difficult birth with my first child and we still feel such thankfulness just to have her here. In difficult parenting moments I still stop and remember her arrival and thank God for the gift of her life and being her mother. I know Chelsy and John will feel the same way. What a great way to remember a difficult time. Yay!!! Congratulations John and chelsey. I thought it was gonna be a boy! Lol. He’s so adorable. Maxwell grandchild #13 and counting! I too had a traumatic labor and delivery with a failed home birth. It can be hard to process but with my husband’s support and God’s mercy , when she hit her first birthday just recently, I felt healing. Thankful Chelsy has plenty of supportive loveing family around her. God is good and faithful. Congratulations John and Chelsy!! Axton is so precious! What an incredible gift from God. Many prayers and blessings for your new little family of 3! Congratulations, Chelsy and John! A precious baby and gift from God and all under His mighty care and protection! What a story of God’s grace and power! Thank you for sharing. We serve such a good and loving God! Love and best wishes for the precious days ahead of bonding and baby care. 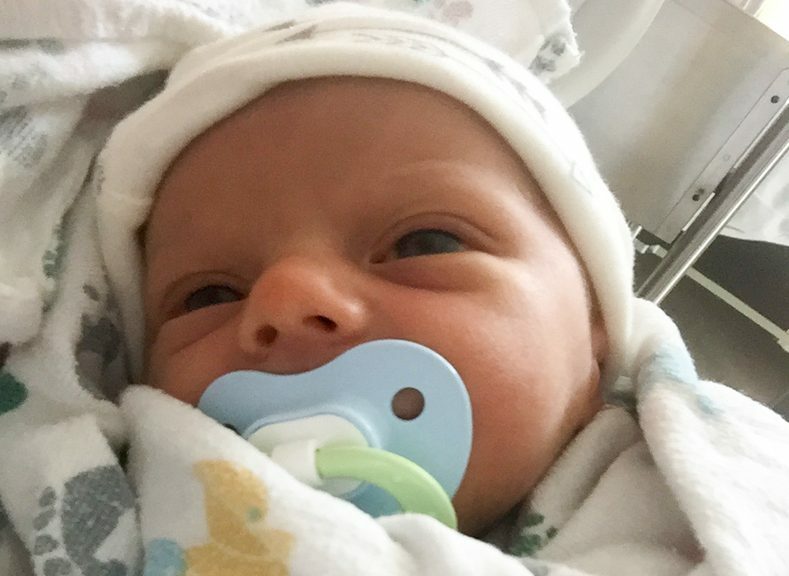 Congratulations, Maxwell family, on your new little guy! He is precious. I had not heard the name Axton, but it so handsome. I understand wanting a unique name. Like another poster above, our church has several multiples of popular Biblcal names..we have two Judes, three Abigails, four (yes!) Elzabeths, and two Samuels. Those names are beautiful and one of the Sams is ours, but a unique name is nice as well. I know they put a lot of thought and prayer into choosing as it’s so important. Enjoy your new arrival and savor the time with him! Yay!!!!! I’m rejoicing with your family!!! Congratulations to Chelsy&John and all of you!!!! 🙂 I’m so thankful for God’s strength through it all and that sweet baby Axton arrived safely!! I’ll look forward to more sweet baby pictures in the future…;) Rich blessings on your sweet, growing family! Congratulations. I also ended up in the hospital with my first after days of labor at home with a midwife attending me. It was very disappointing but I was also thankful not to have a c-section. Thankfully my second arrived safely at home 13 months later, and now 13 months after his arrival I am 28 weeks along with my third and am planning a home birth. I have had difficulty finding a midwife, so please pray for me. God bless. Rosalind, I am sure your two birth stories will be an encouragement to Chelsy. John and Chelsy have said multiple times that while their preference was a homebirth, their goal was a healthy baby and making decisions based on that as they moved through labor. Praying you can find a midwife. Welcome little Axton – we praise the Lord for your save delivery. Congratulation to the whole family! Praise be on the safe delivery of Axton John! Congratulations on the newest addition to your family! So excited to see little Axton! What a strong name! Grateful to hear that even though the labor was rough, God faithfully brought Chelsy through and brought Axton forth! Praising God that they are both healthy! So happy to watch through the years as your kids grew and now they are having their own kids! Fun!! It is a great joy, Debi. You have watched and prayed for us through a lot of life these past years! Little Axton is so precious! Blessings and thank you for sharing! Thank you. Praising the Lord for this little guy! Congratulations!! He is super adorable. I wish I could cuddle him!! I love babies and my family always tells me I am very good with them. Welcome baby Axton!